With more Nigerians displaced almost on a daily basis, the army of refugees displaced by conflicts is by no means a worrisome trend that places the nation at a bigger risk. AGBO-PAUL AUGUSTINE (Abuja) writes on the explosive growth of refugees in Nigeria and around the world. The women, children and men that fled Zamfara State for neighbouring Katsina State to avoid the merciless bullets of daredevil cattle rustlers and bandits had no inclination of becoming refugees in their country. So far, over 3,000 Zamfara residents have joined to increase the estimated 68.5 million refugees around the world fleeing conflicts, natural disasters that has dislodged them from their homes. As the nation tries to swallow the bitter pill of seeing her citizens dislodged from their comfort places due to violence, the news of the massacre in Plateau State last weekend where scores of people were killed in herdsmen attack and the subsequent uproar that followed the carnage shocked the nation. While Nigerians were trying to make sense of the wanton destruction of lives and property in Plateau, scores of people fell in the hands of militia groups, with no fewer than 7,000 Igbeagu Izzi indigenes of Izzi local government area of Ebonyi State were displaced following the inter-communal crisis between Izzi people and their counterparts in Ukele, Cross River State. This, in addition to the hundreds of thousands displaced in the northeast following nine years of brutality in the hands of insurgents. The northeast crisis remains Nigeria’s biggest humanitarian crisis since the end of the Civil War in 1970 with refuges scattered around the country. Some have not seen their homeland for all the time the crisis has raged. Other areas where crisis has rendered people refugees are Benue, Kaduna, Taraba among other states facing the same fate. This is aside the Cameroonian Anglophone region’s crisis that has seen droves of displaced Cameroonians fleeing conflict in their country. Nigeria has been a safe haven for not a few of them taking shelter in Benue and Cross River States. 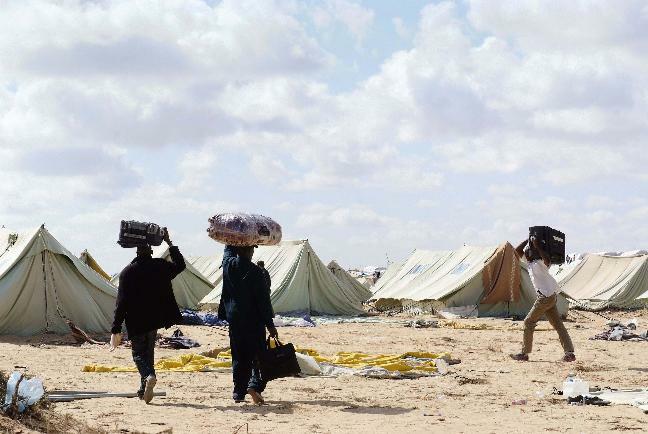 As the number of refugees worldwide hits 68.5million, Nigeria no doubt is one of the biggest contributors to the astonishing rise in the number of people fleeing conflict with her protracted internal conflicts that has eluded solutions so far. This year’s World Refugee Day 2018 has seen the United Nations publish a damning report stating that just 100,000 refugees were resettled by the international community in 2017, a year in which 2.9 million new asylum seekers were created as conflicts raged in Syria, Myanmar, the Democratic Republic of Congo and South Sudan. The figure remains the biggest single-year increase in the history of the Office of the UN High Commissioner for Refugees (UNHCR), equates to 44,500 a day and brings the total number worldwide to 68.5milion. “We are at a watershed, where success in managing forced displacement globally requires a new and far more comprehensive approach so that countries and communities aren’t left dealing with this alone,” said Filippo Grandi, UN High Commissioner for Refugees. “But there is reason for some hope. Fourteen countries are already pioneering a new blueprint for responding to refugee situations and in a matter of months a new Global Compact on Refugees will be ready for adoption by the United Nations General Assembly. The UNHCR works to provide legal protection for the stateless, raise awareness of their circumstances and develop long-term solutions to their problems with governments. The organisation’s efforts aim to protect those fleeing conflict from sexual exploitation, abuse, violence and forced enlistment in military groups, offering education, training, medical aid and emergency shelter, often in partnership with international humanitarian organisations. The UNCHR Regional Office released Nigeria’s refugee update as at March 2018 put the figure as 206,033 for Nigerian refugees displaced by the insurgency in Cameroon, Chad and Niger as of 31 March 2018 and 2,193,769 Internally Displaced Persons (IDPs) in the region displaced by the insurgency. “Security: In Nigeria, the number of security incidents rose considerably. Among these was an attack on the town of Rann in Borno State, which claimed the lives of 10 people and wounded many others. Ten other suicide bombings and four attacks as well as IED explosions were recorded in Borno and Yobe states, targeting civilian and military infrastructures, predominantly in communities hosting the displaced. Meanwhile, the Government has continued to report progress in its efforts to neutralise the insurgency but the frequency and manner in which attacks are being carried out suggests the situation is going to worsen in the coming weeks. “The conflict has resulted in the deaths of more than 20,000 people and the displacement of millions in and out of the country since it started more than nine years ago. In Maiduguri and Damaturu, road travel has been suspended for all United Nations (UN) staff but for its part, the Maiduguri-Bama-Banki axis was reopened after four years of closure. UN staff will continue to access Bama and Banki from Maiduguri using UN Humanitarian Air Service (UNHAS) flights,” it stated. According to the UN body, “We live in a world full of violence. The violence and fear of persecution forces people to flee their homeland in search of a safe and secure place. Each day millions of families face the existential threat from natural or man-made disasters. It further stated that, every minute at least 20 people leave everything behind to escape war, persecution or terror. People who spoke to LEADERSHIP Sunday were unanimous in their lamentations stating how many more communities will be displaced in Nigeria before a permanent solution is found to the growing number of internal crisis in the country.